Tag Archive | "htc status testing"
I opted to take the HTC Status for a spin recently to see how Android handles hardware that isn’t ‘top of the line’, and I came away quite refreshed; thanks mostly to the size of the screen and the practical battery life. I won’t be doing a full review of this device as a number of other great sites have you covered on that front, but I will be dropping an expanded list of my testing notes. You’ll see some comments about the hardware here in the notes, though you may be interested to see my previous article in which I detailed the impressive hardware of the HTC Status in photos. I’ve also included a gallery of software so you can see how Android smartly scales applications to fit the screen, but they can still feel cramped. The small screen is actually a breath of fresh air. Unlike the 4″+ monster-phones of late, the HTC Status has a 2.6″ screen which is incredibly easy to use because one hand can pull down the notification bar and reach the Android buttons across the bottom of the screen with no shuffling! Keyboard is great, keys are firm with good feedback that isn’t too loud. Keys are not overbound (too many alternate symbols/characters assigned to keys). With a hardware keyboard, knowing whether you are in caps/shift/alt is very important. The HTC Status indicates this easily by changing the way the cursor looks. You’ll never be left guessing which modifier is queued up, even in applications that remove the status bar (like the browser). Typing on the keyboard when not in a text field will take you right to search in almost all places, which is handy as you don’t have to hit the search button. The keyboard backlight is well done; all letters and symbols are illuminated and the lighting is even across the keys. The backlight is toggled intelligently based on the ambient light sensor. The keyboard takes a little getting used to, and could use some simple auto-correction to save time on typing works with contractions. I’ve always wondered why we don’t get the same auto-correction with hardware keyboards as we have with software keyboards. Changing “thats” to “thats” automatically would save me a keypress, and more importantly, brain cycles. By not having to think about using the modifier keys as much (thanks to auto-correction) I could focus more on what I’m typing, rather than how I’m physically entering it into the phone. Phone looks impressively beautiful — it seems HTC doesnt skimp on build quality even on lower end phones. I’ve had a number of people grab the phone and be immediately impressed with it’s build quality and styling, which is very slick and sharp. Kudos to HTC on this! Screen feels way cramped at times. The reality of it is that most applications are designed for larger screens. The HTC Status has a 2.6″ touchscreen @ 480×320 with a 3:2 ratio. Most Android phones on the market are 16:9 on somewhere near it, and the top end phones have At least 854×480 or beyond (with some now creeping up to a ridiculous 1280×720). Cramped, yes, but I was extremely impressed by the robust scaling that applications were able to do to fit themselves on the screen. Despite the low resolution, apps look impressively sharp on the phone’s screen; a testament to Android’s forward thinking scaling capabilities. You can use the HTC Status in portrait mode by tilting it on its side. It looks a little silly but is actually quite useful. Most Android applications are designed for portrait orientations, and the HTC Status uses a landscape orientation. Flipping it to portrait actually makes some apps easier to use. You can see some examples of this in the software gallery bellow. Multiple sign-ins for the same accounts are very confusing — not easy enough to use for the target demographic. When you set up your phone, you are asked to add your various accounts. 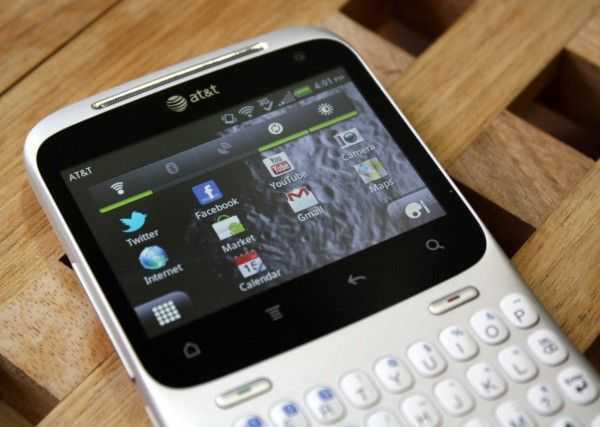 However, the HTC Status is equipped with HTC Sense, a suite of apps and widgets that overlay the Android 2.3 build. HTC Sense wants to get all up in your biz, and it leads to confusion about which app you should use to configure a Twitter, Facebook, etc account. Additionally, HTC Sense is constantly bugging you (through the notification bar) to ‘link’ contacts without explicitly telling you what it is doing. I understand that they are trying to get your twitter/facebook/phone contacts all on one page, but the target demographic may not quite understand this, and it isn’t clear whether or not this is happening for this phone only, of if they are actually going into your contacts (through Google) and editing them. The proprietary FB implementations make the phone less useful than it should be. If you’ve read any of my prior Android reviews where a phone company has slapped on an overlay that wants to manage all your social networking, then you’ll know that I hate proprietary implementations of such features. The HTC Status is another perfect example why — if Facebook makes changes (which they do, all the time), you are left at the mercy of HTC to create an update to fix broken stuff or add new features, and I think we all know the update delay horror stories from numerous Android devices. This isn’t the only issue with proprietary implementations either. Often times you’re left without the ability to actually do what you want. You’re supposed to use the Facebook button on the HTC Status to be able to quickly share stuff to Facebook, and while this works appropriately for photos, links, etc., you are limited to posting to your own wall, or to a friend’s wall. No messaging, no group-only sharing, and pretty much no using the social network in any way other than what’s been defined for you, which is silly. What this leads to is users going with the official Facebook app instead of the limited proprietary implementation. The Facebook button on the HTC Status should be user-configurable to launch any app (I’m sure there are hacks for this, but naturally only a small portion of people will know how to seek them out and install them). Pulling the notification bar down is silky smooth, as is home screen navigation — very impressive for a phone that isn’t touting the latest dual-core CPU and loads of RAM. On that note, the battery life is outstanding compared to recent flagship Android devices (especially LTE ones). Yes, you could actually wake up to a still functional phone if you forgot to plug the HTC Status in at night. I dare say, you might even be able to get 2 days use out of one charge! When you’re in the web browser, the status bar disappears which means you can’t see notifications coming through or pull down the notification bar when in the browser. I think this was done to try to provide as much room as possible for web browsing on the HTC Status’ small screen.